Our range of sola flowers on ting are supplied across the globe and are appreciated for their ability to lend that distinctive look to look to flower arrangement, craft or home decor accessory. 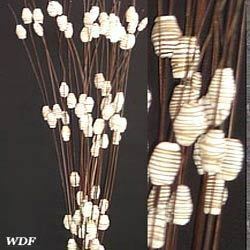 Available in many different colors and various types such as straight or curly ting ting these are liked by interior designers and décor artists and can be stuck into floral styrofoam frogs, tied in bunches or used like a pick or floral spray in larger arrangements of flowers. Exporter of all types of exotic dried flowers, potpourri, pods, bell cup, palm spear, cane cone, curly ting ting, leaves, grasses, sola, palms, beaded ting, curly ting and dried flowers etc.